Rodrigo Duterte told proponents to stop trying to impeach the vice president because she hasn't committed any acts that could be grounds for her ouster. 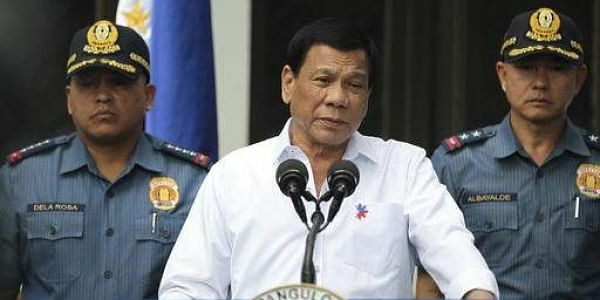 MANILA: Philippine President Rodrigo Duterte told proponents Thursday to stop trying to impeach the vice president because she hasn't committed any "overt acts" that could be grounds for her ouster. Vice President Leni Robredo has criticized Duterte's bloody anti-drug crackdown and other policies, but the president said she has the right to free speech and that removing her from office would damage the country. Philippine presidents and vice presidents are elected separately and often come from rival political parties, like Duterte and Robredo, a former human rights lawyer. "Guys, lay off. Let's stop it. You can do other things but do not tinker with the structure of government. I will not countenance it," Duterte said when asked at a news conference about an impeachment complaint filed this week against Robredo in the House of Representatives. "She was elected so why do you have to ... just because she keeps on harping on me? Let her, this is a democracy, freedom of speech ... there are no overt acts committed," said the president, a former government prosecutor. "Why will you destroy the country?" Duterte also was the subject of an impeachment complaint filed last week over his anti-drug crackdown, which has left thousands of mostly poor drug suspects dead, and alleged corruption, although the bid faces an uphill battle with Duterte's allies holding an overwhelming majority in Congress. Duterte denies condoning extrajudicial killings but has repeatedly threatened drug lords and dealers with death in public speeches. The United States, European governments and U.N. rights officials have expressed alarm over the large number of killings in the crackdown. Early this week, a lawyer and a losing senatorial candidate filed a draft impeachment complaint against Robredo in the House, alleging she violated the constitution and betrayed the public trust with her actions, including a videotaped message to a U.N.-linked human rights forum in which "she betrayed the people by shaming the nation with her dishonest message to the United Nations." In her message, Robredo raised concerns about the mounting number of killings of drug suspects in raids she described as "summary executions," and about a lack of transparency and accountability in Duterte's crackdown. The drug problem, she said, can't be solved "with bullets alone," adding that Filipinos should "defy brazen incursions on their rights." The remarks were one of Robredo's sharpest criticisms of the president's campaign and drew criticism from Duterte's allies, including House Speaker Pantaleon Alvarez, who said he also would study the possibility of filing an impeachment bid against Robredo, who he said undermined the Duterte administration before the international community. Another group of lawyers said at a news conference Thursday that they plan to file another impeachment complaint against Robredo in the House, which is on a summer break. Robredo, who belongs to the opposition Liberal Party, resigned from a Cabinet post in December after being prevented from attending Cabinet meetings, citing "major differences in principles and values" with Duterte.